HARBIN - A passenger plane with 96 people on board crashed during landing at a forests-surrounded airport in northeast China's Heilongjiang province amid thick fog late Tuesday. Yichun Mayor Wang Aiwen on Wednesday corrected the death toll to 42 from the previously reported 43. Fifty-four others were injured, including seven severely, he said. The injured are being treated in four medical institutes in the city. Wang Xuemei, the city's vice mayor overseeing the rescue efforts, said most of the hospitalized suffered broken bones. The ERJ-190 jet, manufactured by the Brazilian aerospace conglomerate Embraer with maximum passenger capacity of 108, crashed near the runway of Lindu airport of Yichun at 9:36 pm Tuesday, some 40 minutes after it took off from the provincial capital Harbin. Ninety-one passengers (including five children), and five crew members boarded the plane, sources with the Civil Aviation Administration of China (CAAC) said. There is no official account of what happened during the landing and the investigation into the cause of the crash has not yet concluded. Work crews are continuing to search the black box in the wreckage. Hua, head of the publicity department of the Yichun city committee of the Communist Party of China, said the jet broke into two pieces approaching the runway. Some passengers were thrown out of the cabin before the broken jet crashed to the ground and engulfed in blaze. Witnesses said a huge blaze enveloped the wreckage and the flames reddened the surrounding forests. The blaze had been put out before dawn Wednesday. Some said the airport, nestled in a thickly-forested valley, is not able to accommodate landing flights during the night. 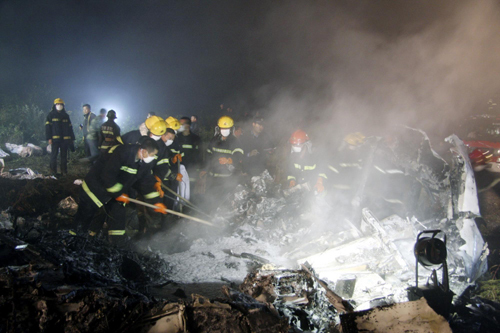 Local aviation officials declined to be interviewed while a team of CAAC officials and technicians left Beijing for Yichun to participate in the rescue and investigation. The tragedy also prompted Chinese Vice Premier Zhang Dejiang to lead a team of transportation, health, work safety, and security officials to Yichun overnight. Lindu Airport is located in a forest some 9 kilometers away from downtown Yichun, a city with about 1 million population. Henan Airlines launched the Yichun-Harbin service one year ago and operated flights by ERJ-190 jets three times a week. The carrier, based a central China province with the same name, was previously known as Kunpeng Airlines and was only renamed Henan Airliens last year. It is run by the Shenzhen-based Shenzhen Airlines.